A wide range of articles addresses the importance of keeping project teams and leadership aligned. However they fail to provide real-life and quantified examples. This article, based on SteerIO project data, quantifies the gaps that might occur between managers and their teams, and suggest an innovative way to secure alignment witin project teams. Leading projects to success is a craft that can deliver (or save) organisations millions of dollars per initiative on a yearly basis. A critical aspect is the ability to keep all project stakeholders aligned to deliver the targeted milestones. But what happens when asymmetries between project leadership and team occur? First of all, having misaligned teams prevents from driving the project in a single clear direction. This produces frictions and unproductive project work, generating significant efficiency losses and eventually failing to deliver the targeted project ROI. It is always better to do the right thing than doing things right. Second, divergences over time are mentally exhausting for project teams, thus driving individuals engagement down: when such shifts in mindset occur, people tend to be less proactive and more distracted. Tasks take more time to be completed, meeting duration explodes and quality of deliverables drops. Finally, in the long run, misalignment can have dramatic consequences that go beyond the project scope, impacting the whole organisation: employee turnover increases (especially for highly skilled profiles) and company culture deteriorates. But beyond those commonly agreed issues, what are data really saying? How can we measure misalignment at the group level (team vs. manager)? Are project professionals (e.g. consulting teams) spared from misalignment issues? We studied two SteerIO projects with similar setups: medium-sized consulting teams (ca. 8 resources) during the November rush (usually a high intensity phase for project teams). Every week, teams are asked to complete a ca. 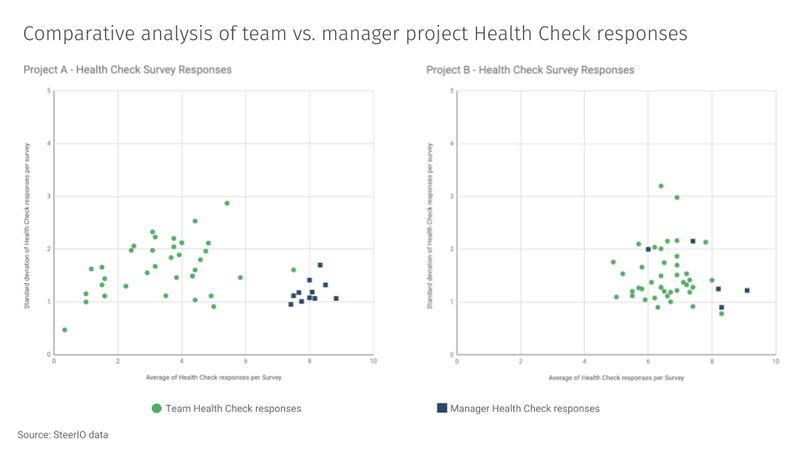 10 question survey (project health check) to evaluate and monitor several project success factors (e.g. clarity of objectives, ability to take decisions, ability to deliver project-work on-time, work life balance...). Results are anonymized, aggregated, a report is generated and delivered to the manager and the team to highlight improvement opportunities and secure project execution. First observations: both managers seem to rate their respective project better than their teams. From a group dynamic perspective, this is an understandable human behavior. Managers have stronger vested interests and are hence incentivized to provide a glossier picture of the project. From a leadership point of view, the first dilemma is to decide whether they want to know or not. The reality is that you can only act effectively on what you can measure. Hence, it is a leadership decision whether to confront the reality of the project or to keep distance with the frontline. Management practitioners and researchers highlight that developing self awareness is a core skill of the modern business leader. In parallel, building a strong data culture among teams will be a critical capability for organisation in a digitalized world. Leaders and teams that can combine both on their projects will generate superior results. Once leaders have decided to address the topic, they need to capture and make sense of the mass of soft-data that are gravitating around the project and act upon them. At SteerIO we call it collective intelligence: being able to gather, leverage insights from the project teams and manage emerging project issues proactively. In an era where agile principles are democratizing and data ubiquitous, it is time to empower teams and project leaders to close the project execution gap and reinforce alignment between project stakeholders.